Research suggests that merely listening to music changes our world in amazing ways. From how we walk, talk, remember events and deal with emotion, music plays a part in many people’s lives. 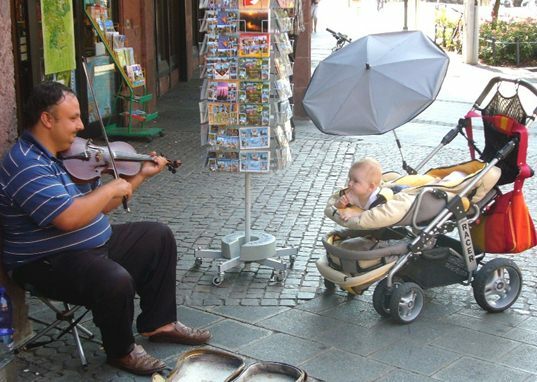 Past studies have also shown that exposing your baby to music is a great idea. Singing, listening to and creating music helps your little one to develop important mental processes and improves spatial reasoning. Now a new study recently published in the journal Developmental Science delves deeper into the world of musical babies, suggesting that 1-year-old babies who have an early relationship with music, and more specifically early musical training, smile more, communicate better and show earlier and more sophisticated brain responses to music. The researchers also noted that infants who participate in music classes “Showed superior development of prelinguistic communicative gestures and social behavior” as compared to their non-musical peers. This means that babies exposed to music point and wave earlier than other babies and they are easier to sooth and show less distress when things were unfamiliar or didn’t go their way. According to the researchers, the best musical exposure is interactive. Babies who simply listen to music don’t gain the same awesome benefits as babies who have parents who use music as an interactive tool. For example, as a parent, you can sing lullabies and nursery rhymes to your baby plus combine songs with interactive actions, such as working together with your baby to learn to play percussion instruments or taking turns when singing. If you want to expose your baby to music early on, see our favorite green music toys for young children. Love the article. Would like the citations for the statements ie Babies who simply listen to music don�t gain the same awesome benefits as babies who have parents who use music as an interactive tool. I am the founder of Music with Mar., Inc and posts weekly blogs on this subject. I would love to use this research. Thank you. Research suggests that merely listening to music changes our world in amazing ways. From how we walk, talk, remember events and deal with emotion, music plays a part in many people's lives. Past studies have also shown that exposing your baby to music is a great idea. Singing, listening to and creating music helps your little one to develop important mental processes and improves spatial reasoning. Now a new study recently published in the journal Developmental Science�delves deeper into the world of musical babies, suggesting that 1-year-old babies who have�an�early relationship with music, and more specifically early�musical training, smile more, communicate better and show earlier and more sophisticated brain responses to music.